Allende (Salvador Allende Gossens and Chile’s 3 year tryst with revolution). A Chilean dream that turned nightmare. When Allende leader of Unidad Popular coalition came to power in September, 1970 by the power of ballots (his party could garner only about 36% of the total votes polled) it was a surprise to the socialists all over the world and they were dreaming a world ‘full of socialism’. Young Turks of the party in their overflowing ecstasy requested him to move in to a slum and reside there as a truly proletariat president! Fidel Castro (the father of all revolutions) in turn advised him that ‘never be a democrat as it is against the fundamentals of socialism’! A lover of all good things. 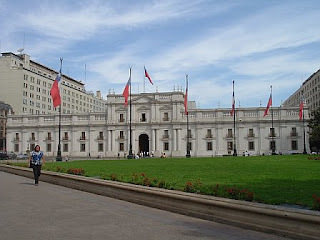 As a gentleman to the core Allende ignored both, he preferred to live in the Moneda palace itself among all the luxuries due to a capitalist president as ‘he could only maintain the proper revolutionary spirit among the lovely paintings and exquisite carved-ivory pieces of his luxurious suburban villa’. Moreover he loved good food, class-drinks and enjoyed company of pretty women (classier the better)! When his soul craved for socialism body desired to be engulfed in bourgeois luxuries. As the first democratically elected Marxist President Allende’s honeymoon in power was endowed with the ‘glory and freshness of a dream’ as in the case of all debutants he was all set to sweeping changes in the economy of the nation. The long pending demands of his party was first to be met, as a first step wages and welfare measures to workers were enhanced, prices were frozen and all the mining companies were nationalized. There were pressures from comrades for more radical steps; which he was forced to follow as a coalition leader. For about one year all worked but no body noticed the dark fact that nations exchange reserves were fast depleting due to the unsustainable measures, the unprecedented hike in wages and welfare measures increased cost of production and the artificial price-freeze made production unviable and all industrial activities came to a grinding halt, shortage of commodities became the norm, inflation exceeded 300%, shops were with empty shelves, women began to demonstrate clanging empty pots and pans. The extremists in the ruling party were engaged in seizing land belonging to ordinary people and the government was looking the other ways when party-men were taking law and order in their own hands, these situations invited the wrath of middle class and without fearing police or army they voluntarily jumped in to agitations. From the state of a well to do nation Chile was sliding to poverty people were driven to starvation. USSR ‘the godfather of all revolutionaries’ was not in a position to lend a helping hand as that itself was mired by internal problems. Flow of capital from America was stopped as the nationalization policies irked industrialists who fled to other green pastures. Mining (the bread and butter activity of Chile) was hit for want of capital infusion as well as lack of entrepreneurs. The initial dreams floundered in to nightmares! Allende was aware that things are not moving as he desired, he had only the mandate of 36% and was only legal rights to sweeping changes, put between hardliners in his own party and the opponents he had to take many half-hearted steps which worsened whole affairs. The formation of Neighborhood Judicial Tribunals constituted entirely by extremists to harass those were not with them and the ‘Unicameral Parliament’ for the election as well as manipulation of judiciary, nationalization of small business (a futile attempt to appease the extremist elements) was the last straw on the back of the Chilean horse which made it to go berserk. When the condition was already explosive in 1972 a move by the government to nationalize transport by forming a state owned transporting company, this triggered the final explosion. Chilean truck drivers struck work en masse, Chile being a longitudinally stretched nation like a ribbon, the transport strike was paralyzing to it. People of all walks of life like doctors, engineers, small and big business men all joined the strike and Chile was on the verge of collapse. There were nothing in the shops and people scrambled for whatever that was available, the national currency became utterly worthless as it was exchanged about 10,000 percent less in the black market Chile was returning in to the archaic barter system. Allende had to resort to a state of emergency followed by mass arrests. His popularity was digging greater depths; once a hero turned in to a villain with a less than three years rule. There is no clear indication how Allende got killed, as per army’s version Allende shot and killed himself. His wife also initially stating in similar lines as he shot himself with the submachine gun given to him by Cuba’s premiere Fidel Castro and she contradicted her initial statements. 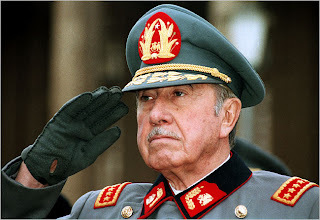 It was the combined forces which installed Army’s commander in chief Augusto Pinochet Ugarte as Chile’s president. Pinochet had many geography books to his credit and he had taught in Quinto and Santiago army colleges in Ecuador. He also had served as military attache in Washington. After the fall of Allende the forces were engaged in a hunting spree; the communists were hunted in their on bastions they were herded to soccer-grounds most of them exterminated. The events occurred in Indonesia were repeating in Chile- a phenomenon unheard of in American continent. The growth of a nation is meaningful only when all the people are benefited. Allende basically a good man lacked economic sense, he thought that artificial freezing of prices and increase in wages would do good to the people. Being a partner in a coalition consisting of hard-core extremists his hands were tied and he had to do things beyond his comprehension, which led to his final fall. Voters in a democracy are an all powerful lot they can elect whoever they like; voters are easily taken for a ride by charismatic orators who chant sweet slogans. Electing candidates based entirely on glamour and charisma was the real culprit in this Chilean story. There may be more ‘Allendes’ in future as far as parameter for voting remains to be glamour and not economic sense. You have a very interesting work here! Congratulations! Just added you to my reader! By the way: which side of the moon are you at? Agree or not this post was very interesting! is very cool your blog! wellcome in venezuela! bye... see you later! Thanks for your post. India, Great country!! Thank you for commenting in my blog, I see that also you have done in different others, but equally I am grateful for it to you. did u understand it?...i mean u speak spanish? by the way im from chile! Allende was killed on the orders of Kissinger. There was a bbc investigation and televised report, in which General Haig (us) admitted that he and henry K. plotttted the coup. They supplied guns, ammunition and money, because they didn`t like communists and socialists. Just google search ***Allende, kissinger haig plot coup***. It is always good to question the official version of events. Allende was murdered, one day, there will be justice. Thank you for visiting my blog. It's really very interesting. 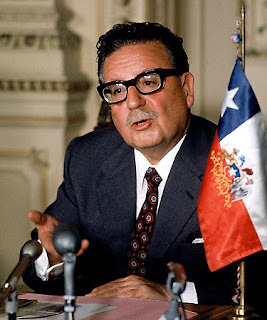 Can I translate in italian language your article about Allende on my blog? Thanks. Thanks for stopping by. Actually my site is mostly in Hungarian, less in English and about my baby, environment-consciousness and Waldorf education but you are still invited to visit it and post a comment.